Conditions today were much better with highs of 10C and a gentle breeze. Individual winner today was Paul Cook (Frenzee) with 121-08-00 of carp from peg 4 on the Specimen Lake. Paul caught on long pole with hard pellet and down his edge on corn. 2nd placed Paul Bucknall (Little Dawley) drew peg 76 on the Specimen Lake and caught in the margins with corn to weigh 83-11-00. 3rd on the day was Steve Rocke (Larford) with 58-14-00 of fish from his margins. Steve caught on dead reds over micro pellet from peg 12 on the Match Lake. 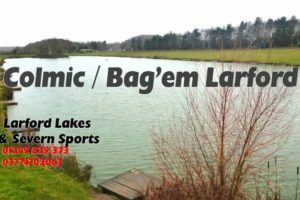 4th placed Pete Jones (Colmic) drew peg 64 on the Specimen Lake weighing in 54-01-00 to 13m pole with corn over micro pellet. 5th placed Mark Skidmore (Larford) drew peg 16 on the Specimen Lake weighing in 51-02-00 to the 13m pole fished with hard pellet. Mark also caught at 6m with corn. 6th on the day was Chris Bradney (HT Angling) with 48-13-00 from peg 46 on the Match Lake.